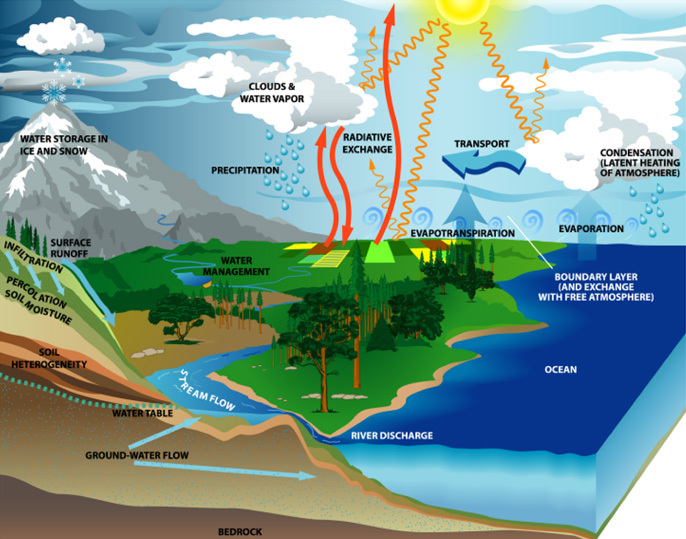 Hydrological cycle refers to the movement of water in various forms within different spheres of the earth surface. It plays an important role in determining the climate through its influence on vegetation, types of soil formed, soil moisture, clouds, snow and ice. The hydrological cycle is also responsible for transport of heat from lower latitudes to mid latitudes. The most important natural phenomenon on earth, the water cycle also known as the hydrological cycle – describes constant movement and endless recycling water between the atmosphere, land surface, and belowground. The hydrological cycle involves exchange of heat energy, which leads to temperature changes. H20 consists of one atom of oxygen of hydrogen. The water molecule has a positive charge on the side of hydrogen atoms and negative charge on the other side. Water molecules tend to attract each other because the positive ends attracts to the negative ends. In reality water molecules are three dimensional, and water follows the VSEPR rules- VSEPR, or Valence Shell Electron Pair Repulsion, is a theory that allows us to build accurate 3 dimensional models of atoms and molecules. The bonds between oxygen and the hydrogen in the H2O molecule are not even, the oxygen has a larger share of the electrons due to its nucleus containing more protons, also called as its electro negativity. 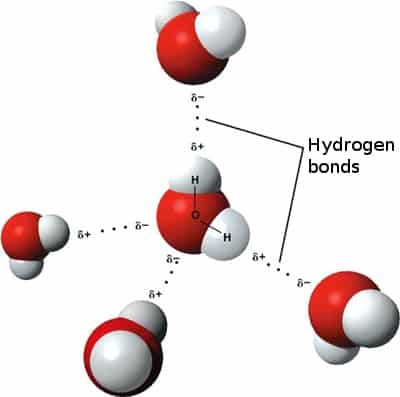 This leads each of those bonds to be a polar covalent bond, resulting in water having a slight positive charge on its Hydrogen atoms, as seen to the right. This then makes water a polar molecule, as it has two negatively charged parts [the electron pairs that are unbound] and two positive parts [the Hydrogen atoms]. These opposite charges are attracted to each other. This holds water molecules together which explains why water is a liquid at room temperature while almost all other similar sized molecules are gases. This also accounts for water’s excellent dissolving capacity for other charged substances such as salt, and why uncharged substances [non polar] such as oil do not mix readily with water. The primary step of the water cycle starts with the evaporation- The primary source of energy for evaporation is the solar radiation. The sun, which drives the water cycle, heats water in oceans and seas. Rising air currents take the water, as vapour, up into the atmosphere, along with water from “evapotranspiration”- which is water transpired or “breathed out” from plants and evaporated from the soil. Air currents move water vapour around the globe; the cooler temperatures in the atmosphere cause it to condense into clouds. The cloud particles collide, grow, and float around until they fall from the sky as precipitation. Some precipitation falls as snow and can accumulate as ice caps and glaciers, where it can stay, as frozen water, for thousands of years. In warmer climates, snow melts during the warmer spring and summer months, and that water flows into streams and rivers, which eventually return it to the ocean, or into the groundwater, which eventually reach underground aquifers. Then again the initial process continues to roll. This is a big cycle and a never ending process. The transformation of water from liquid to gas phases as it moves from the ground or bodies of water into the overlying atmosphere. The primary source of energy for evaporation is the solar radiation. Evaporation often implicitly includes transpiration from plants, though together they are specifically referred to as evapotranspiration. Total annual evapotranspiration amounts to approximately 505,000 km3 [121,000 cu mi] of water, 434,000 km3 [104,000 cu mi] of which evaporates from the oceans. Evaporation should not be confused with boiling because when water undergoes evaporation, only water molecules that are on the surface of the water are actually turning into water vapour. In the boiling process, existing water reaches a complete phase change and therefore, the water is being turned into gas at a much faster rate. For e.g. 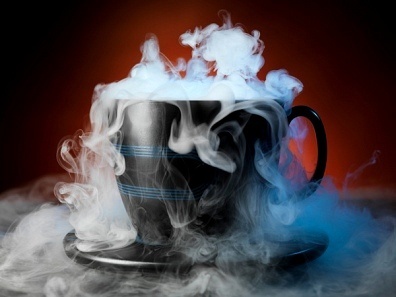 the steam that is rising off of a pot of boiling water is water vapour evaporating. The movement of water through the atmosphere, specifically from over the oceans to over land, is called transport. Some of the earth’s moisture transport is visible as clouds, which themselves consist of ice crystals and/or tiny water droplets. 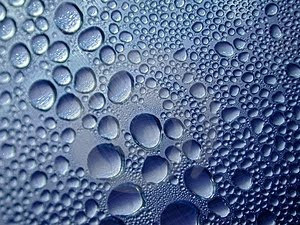 Condensation is the change of physical state of matter from gaseous phase into liquid phase. In the water cycle process, the change is from water to water vapour. Precipitation is any product of the condensation of atmospheric water vapour that falls under gravity. Precipitation is a main component of water cycle. Precipitation occurs as rain and also as snow, hail, fog drip, and sleet. Approximately 505,000 km3 (121,000 cu mi) of water falls as precipitation each year, 398,000 km3 (95,000 cu mi) of it over the oceans. Precipitation can be divided into 3 categories, based on whether it falls as liquid water that freezes on contact with the surface, liquid water or ice. Rain is a type of precipitation during warmer weather, occurs mainly when the clouds are saturated. Snow is a type of precipitation like rain but at cooler temperatures eventually melts and becomes runoff in stream Mechanisms of producing precipitation include convective, stratiform, and orographic rainfall. Stratiform processes involve weaker upward motions and less intense precipitation. Convective processes involve strong vertical motions that can cause the overturning of the atmosphere in that location within an hour and cause heavy precipitation. Some of the precipitation soaks into the ground and this is the main source of the formation of the waters found on land – rivers, lakes, groundwater and glaciers. There are different ways by which water moves across the land; they are surface runoff and channel runoff. Surface runoff is when the precipitation rate exceeds infiltration rate, or when the soil is saturated, water begins to move down slope on ground surface. As it flows, the water may seep into the ground, evaporate into the air, become stored in lakes or reservoirs, or be extracted for agricultural or other human uses. Infiltration is the process by which surface water enters into the soil ground. Once infiltrated, the water becomes soil moisture or groundwater. It is related to the saturated hydraulic conductivity of the near soil. Infiltration is governed by two forces, gravity and capillary action. Capillary action is when the water gets absorbed to the soil under the force of gravity. The process of infiltration can continue only if there is room available for additional water at the top of the soil surface. This is a general hydrological budget formula, when all the components except “infiltration component “are known. Sublimation is when a solid turns directly into a gas, instead of first becoming a liquid. In the water cycle, this is seen when ice or snow is heated up enough to turn directly into water vapour. The movement of water in solid, liquid or vapour states through the atmosphere. Advection is a lateral or horizontal transfer of mass, heat, or other property. Accordingly, winds that blow across Earth’s surface represent advection movements of air. Advection is important for the formation of orographic cloud and the precipitation of water from clouds, as part of the hydrological cycle. Advection also takes place in the ocean in the form of currents. Without advection, water that evaporated over the oceans could not precipitate over land. Transpiration is the process where water contained in the liquid form in plants is converted to vapour and released to the atmosphere. Water Vapour escapes through open stomata, mainly on the undersides of leaves. Water enters the stomata from the inner cell; the guard cells open creating pores through which water vapour escapes, this process is called Transpiration. Greenhouse gases and global warming are the major players that are seriously disrupting the world’s water cycle. It has been estimated that global warming by 4°C (7.2°F) is expected to increase global precipitation by about 10 percent. Increasing atmospheric concentrations of greenhouse gases, mainly carbon dioxide, have led to a warming at the surface, by nearly 0.6°C (1.0°F) during the twentieth century, and it is widely believed that this trend will continue in the twenty-first century, leading to a higher sea-surface temperature and several other natural calamities. How does the Hydrological Cycle work? Where is all the Earth’s water? Water is the most widespread substance to be found in the natural environment and it is the source of all life on earth. Water covers 70% of the earth’s surface but it is difficult to comprehend the total amount of water when we only see a small portion of it. The distribution of water throughout the earth is not uniform. Some places have far more rainfall than others. There are many reasons for this, such as where the mountains are and where the prevailing winds blow. This rainfall distribution partly explains the differences in vegetation and why some areas are deserts and some are rainforests. Water exists in three states: liquid, solid and invisible vapour. It forms the oceans, seas, lakes, rivers and the underground waters found in the top layers of the earth’s crust and soil cover. In a solid state, it exists as ice and snow cover in polar and alpine regions. A certain amount of water is contained in the air as water vapour, water droplets and ice crystals, as well as in the biosphere. Huge amounts of water are bound up in the composition of the different minerals of the earth’s crust and core. Urbanization impacts on the concentration of water demand, increase in aggregate water demand and the alteration of local hydrological cycle. Usage of water by the people of Canada. Water foot print. Water utilised for making one KWh of electricity.